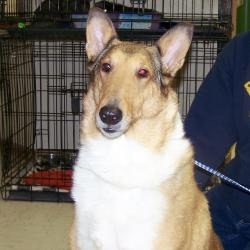 Notes: Christy is an older, smooth coat collie. She is a very kind gentle dog that came to us when her owner decided to "downsize". This loving dog deserves a home that will cherish her in her senior years. Christy is up-to-date with routine shots, house trained and spayed/neutered. Christy is located in North Dakota, approximately 5 1/2 hours south of Regina. Click Contact Information below for more details. Christy has been moved into archives as she has been placed through the other organization.